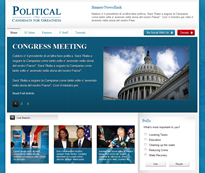 Shape 5 have released Political, a new theme for Joomla 1.5 and if you are campaigning or thinking about it - this theme will certainly make the right first impression. But like all themes from Shape 5, just because they gear it towards a specific theme at the start of the month, it doesn't mean if you are not in politics that you can't use it too. Personally, I think it is all set up as a great looking news site - but that is just my opinion. The theme also comes with a new Twitter module, validates with CSS level 3, has dynamic modules and comes with everything you would expect from Shape 5.